Freedmen’s Town is a nationally registered historical site. The site was originally a community located in the fourth ward of Houston, Texas that began in 1865 as the destination for former enslaved people from surrounding plantations in Texas and Louisiana after the Civil War. Freedmen’s Town is located southwest of downtown. After emancipation was proclaimed in Texas on June 19, 1865, former slaves began migrating to Austin, Dallas, Galveston, and other cities but the largest migration was to Houston. Many of these newcomers traveled along San Felipe Road into the city from Brazos River Plantations south and southwest of Houston. Once there they paved many of the streets in brick. These new residents established a community where they were able to live mostly without the daily onslaught of racism and discrimination. Freedmen’s Town quickly developed as a cultural center with the establishment of Antioch Missionary Baptist Church (1866) followed by other churches and social and cultural institutions, The community and the larger fourth ward black community that grew around it, was prosperous well into the early 20th Century. By 1930, Fourth Ward held approximately one third of Houston’s 36,000 African Americans and was famous for its many businesses that included restaurants and jazz night clubs which attracted even white Houstonians to the area. Despite this apparent social and economic prosperity, black Houstonians and especially Freedmen’s Town residents were limited by a segregated environment which denied access to most city services and formal rules and informal practices that prevented them from gaining better jobs. In 1929, the Houston City Planning Commission proposed a permanent geographical and racial segregation of Houston that limited black residence to the Second, Fourth, and Fifth Wards. While the Houston City Council refused to adopt such a plan (partly because it was illegal), blacks in Freedman’s Town and the Fourth Ward faced restrictive covenants and redlining practices that prevented African American mobility to most other parts of the city. Some fortunate middle class black residents were able to move to other racially segregated but newer communities in South Houston including Studewood, South Park, Riverside Terrace, Kashmere Gardens, and Acres Homes. 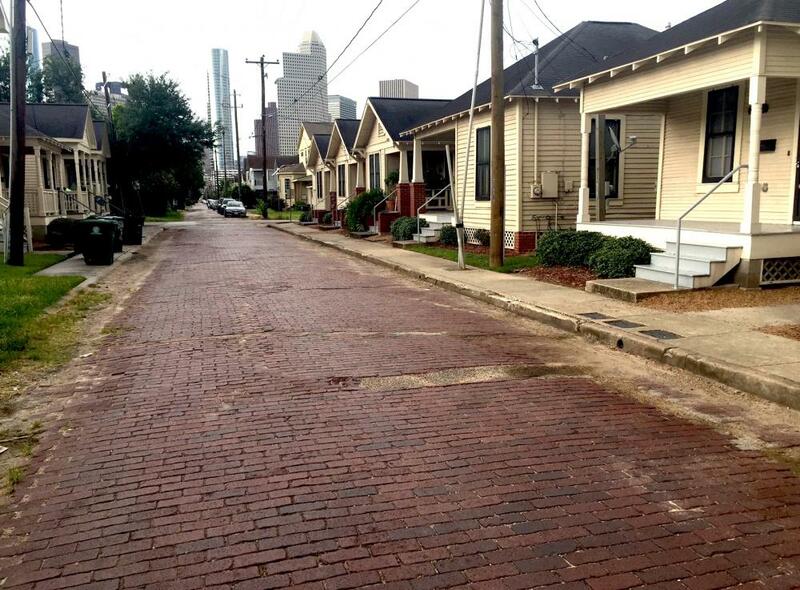 Meanwhile the original Freedman’s Town community was threatened in the 1930s by the expansion of downtown Houston. Parts of the district were replaced by the new City Hall, the Albert Thomas Convention Center, the Gulf Freeway, the Allen Parkway Village, a public housing project. On the eve of World War II other parts of the district were replaced by San Felipe Courts, one of the largest public housing projects in the city’s history. Initially Houston government officials promised that Freedmen’s Town residents would have access to San Felipe Courts but after the United States entered World War II, the project was reserved for white military families. Authorities even constructed a wall between San Felipe Courts and what remained of Freedmen’s Town. The housing project would not allow black residents until 1968. In the 1970s, historic preservation groups, recognizing that most of Freedmen’s Town had already been lost to newer development, began to work to save the remaining homes, churches, and businesses. They persuaded the U.S. government to designate Freedmen’s Town a nationally registered historical site in 1985. Other organizations such as the Rutherford B. H. Yates Museum which was founded in the community in 1996, continue to work today to save the houses and brick-paved streets laid out by freedmen in the 1860s, from further destruction and redevelopment. Gladys Marie House of the Freedmen's Town Association, Inc., A Brief History of Freedmen's Town, http://www.isocracytx.net/hp-org/FTAbrief.html; Margo Walker Taylor, “Preservation of Houston’s Freedmen’s Town jeopardized,” The Weekly, Metro Newspaper, April 14, 1998, p.19; Angelo Podagrosi and Igor Vojnovic, “Tearing Down Freedmen's Town and African American Displacement in Houston: The Good, the Bad, and the Ugly of Urban Revival,” Urban Geography, May 1, 2008, pp. 371-401. Gladys Marie House of the Freedmen’s Town Association, Inc., A Brief History of Freedmen’s Town, http://www.isocracytx.net/hp-org/FTAbrief.html; Margo Walker Taylor, “Preservation of Houston’s Freedmen’s Town jeopardized,” The Weekly, Metro Newspaper, April 14, 1998, p.19; Angelo Podagrosi and Igor Vojnovic, “Tearing Down Freedmen’s Town and African American Displacement in Houston: The Good, the Bad, and the Ugly of Urban Revival,” Urban Geography, May 1, 2008, pp. 371-401.